UPDATE: The LG ThinQ WK7 is now available, and we'll have an expanded review soon. With the LG ThinQ WK7 smart speaker, LG is looking to take on two new challenges in one swift swoop. Firstly, it’s looking to make a name for itself within the increasingly-competitive voice command-driven smart speaker space, and secondly it’s looking to leverage the high-end audio-nous of the Meridian audio team, as part of a newly-inked partnership with the UK audiophile brand. 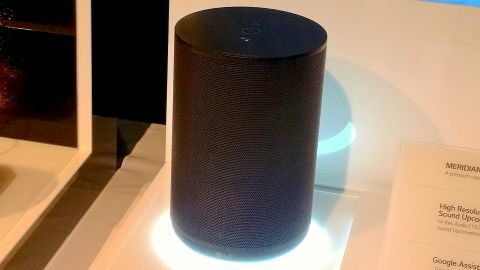 Its Google Assistant speaker certainly achieves that second goal – outside of the Apple HomePod, this just might be the best smart speaker we’ve heard yet. Though its cylindrical shape suggests a 360-degree soundstage, the LG ThinQ WK7 is actually a more conventional front-firing speaker, but taking advantage of Meridians sonic skills, it performs above expectations on a quick first listen. Supporting high-resolution audio playback from services like Tidal, and capable of playing FLAC, WAV and Apple lossless file formats, the LG ThinQ delivers clear and precise playback, even at louder volume levels. It’ll take some time spent with our own preferred testing tracks to truly put it through its paces, but the 24-bit / 96kHz tracks we heard sounded a cut above what you’d get from an Amazon Echo Plus. But it does look like the ThinQ's going to have a price to match. Launching at the end of April for $199.99 (£199.99 / AU$299), this speaker is priced in a bracket where it’s looking to compete more with the likes of Sonos than Amazon’s loss-leading Alexa devices. It's worth noting that unlike its competitor (and hopefully soon the HomePod), there’s no option to create a stereo pairing here. What Meridian’s expertise does bring to the table is some smart digital processing capabilities, taking 48kHz / 16-bit recordings up to 96kHz / 16-bit levels, and from there on to 96kHz 24-bit. It’ll never be a match for a native hi-def recording, but it should help to squeeze a little more refinement out of your audio library if you’ve not invested in a ton of lossless audio files. Meridian also brings its own tuning expertise to the table – LG isn’t exactly a ‘name’ in the audio space. Meridian’s Clear Vocal and Enhanced Bass modes are on offer, and do exactly what you’d expect, the former pushing vocals to the fore, and the later raising the bass levels. As for smart functionality, it’s (almost) standard Google Assistant fare. We say “almost”, as LG has opted to support the newish Android Things, Google’s Internet of Things core platform. This should give it some future proofing for interfacing with future IoT devices, as well as making it more secure. Other than that, it’s your usual “Hey Google” shout, followed up by voice commands to control smart home gear, check news and info, and playback songs from your preferred services, among other functions. These are supplemented by a few hardware controls. A central “F” for Function button the top side of the LG ThinQ speaker swaps between Wi-Fi and Bluetooth connections, with touch sensitive volume buttons either side, a Play/Pause button above that, and a dedicated Google Assistant button given a splash of colour below. On the rear is a mic mute button, but there’s no provision for hooking up an audio device over a wired connection if you’re looking to play back through the speaker using less smart gear. The ThinQ WK7 is a promising looking speaker from LG. It’s not trying to break the mould, but by partnering up with Meridian it looks to have made for a solid team in the audio stakes. Whether it can find a space in the increasingly packed smart speaker space remains to be seen, especially since (sound quality aside) there’s no massive differentiator here against the competition. Still, there’s no denying the LG ThinQ WK7 looks ready to stand toe-to-toe with rivals, and at the very least you’ll have plenty of options when hunting out a smart speaker in the shops. We’ll have more on LG’s entry when we sit down with it soon for a full review.